I've tried three of the four BLOOD Concept scents repeatedly and I don't know if they're actually dreadful, or if they have some merit but I just don't like them. But like them I don't. O was very odd and not actually horrible, but it didn't have much to recommend it unless you can't find the perfect combination of raspberry and bizarre. AB was appalling. And B is a fruity mess. Tahitian Treat in an old-school steel can. And then there's some patchouli and the olfactory equivalent of a buzzing fluorescent light bulb, and my god, it lasts for inescapable hours and hours, buzzing away at you but never turning into anything good or wearable. I would have posted more in the last few weeks — I was all ready to — but I spent a week and a half in Ontario with my mother, who is now a widow. Her husband of thirty-five years, my stepfather, Hans, died a few weeks after his 77th birthday, on October 29th, of various complications of lung cancer and cardiac disease. He emigrated to Canada from Germany at the age of 23, speaking literally no English; he learned quickly enough, mostly from television and wrestling matches, but kept an unmistakeable German accent until the day he died. He was quick-witted, unhesitatingly generous, personable, stubborn, charming. He adored my mother. He was an excellent man and the world is a smaller place without him in it. Over the last thirty years I have given my mother many, many scents: full bottles, many miniatures, uncountable samples. I guess she got others by herself along the way, but most of it was my fault. She has kept pretty well all of them, even if she doesn't wear them, and a good thing, too, because during my visit I reclaimed a few of them from her — borrowed them back for a while, though she knows she may never see them again and doesn't care. I now have a tiny bottle of vintage Montana Parfum de Peau, thank god, and an ounce of Lancôme Magie eau de cologne (she didn't get it from me and has never opened it) from what seems to be the seventies. Or maybe the sixties! On returning from my mother's in Penetanguishene, I had an hour in Toronto between the bus and the airplane, so I checked my bags at the bus terminal and headed over to the Eaton Centre. I poked around in the fragrance department of Sears, not really expecting to buy anything but wanting to see the Christmas gift sets, and I was plagued by salespeople, despite wearing visible earphones and plainly minding my own business. (One of them continued to stand expectantly by my side after I said, "I'm fine," forcing me to elaborate: "I'm fine, I'm just browsing, thanks.") After about eight interruptions I gave up and left, so mission accomplished, Sears, if your mission was to drive a customer away. I moseyed up to Sephora, where I was completely ignored, thank goodness, and where I discovered to my surprise that they carry Comptoir Sud Pacifique; I hadn't really paid any attention to the line since they stopped carrying it locally five years ago, and the couple of them that I had tried since then (including this one) hadn't impressed me. So what did Sephora have? Not much: Vanille Extreme (I have enough plain-vanillas already), Coco Extreme (yuck), Vanille Abricot (of course, the top seller), Coco Figue (new, and really yuck), and...what's this? Vanille Ambre? Gimme! I sampled it. I bought it, of course. Vanilla plus amber? For me? I think so. When packing to head up to my mom's place I brought a bunch of little vials and decants of scents, some old favourites and some new things that I thought I'd have time to review. (I managed one.) Among the things I brought was a little decant of Vanille Abricot that I had made up a few years ago so I could have it with me all the time, but had forgotten about when other things moved in to fill its niche in my backpack. And an amazing thing had happened to it: exposed to a small amount of air in its bottle and left to its own devices, it had ripened into something glorious, a deep apricot-brandy scent, boozy and heady, underlined but no longer dominated by that cooked-vanilla-sugar scent that the fresh version still has (I checked). It is magical, alchemy, and I couldn't duplicate it if I tried, but I am going to enjoy that little decant for as long as it lasts. Once I got to the Toronto Island airport, I took the Vanille Ambre bottle out of its box and transferred it to the one-litre bag we have to fit all of our various liquids into: better that than risking it in checked luggage. Once in line for check-in, being a clumsy sort, I predictably dropped the bag. The Vanille Ambre bottle, being very heavy glass, survived the experience intact, but two of those dozen or so vials I'd brought didn't (because I suppose the CSP bottle landed on them), and one of the demolished vials was AB, which fortunately I had already written about but unfortunately I despise, meaning that everything in the bag now smells like that, and who knows how long it will take to fade away. 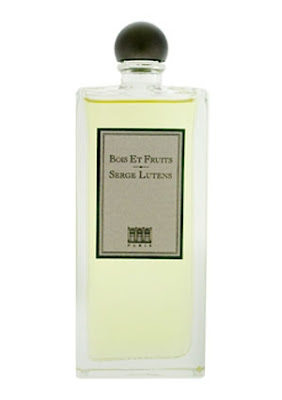 You do not sample a Comptoir Sud Pacifique scent expecting classical constructions of depth and subtlety. They are without exception simple, often minimalist, expressing a single idea: chocolate-chip cookie, red fruit, briny seaside. I love them: they're mindlessly fun. 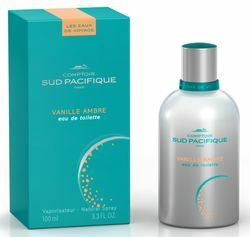 Vanille Ambre is more or less exactly what it says: that warm rich CSP vanilla drizzled all over a chunk of warm amber. There's a slug of patchouli, just enough to give the scent a pleasantly musty old-book smell from time to time. And that's it. 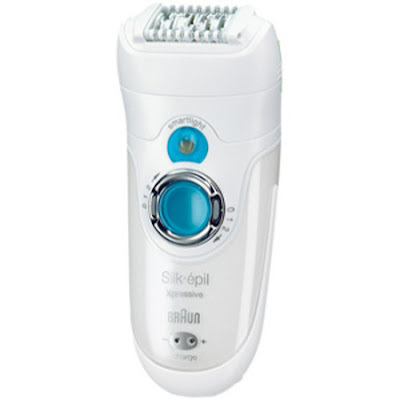 It lasts twelve hours without flinching. Unless you have gingerbread fantasies at this time of year, it is hard to imagine a better winter scent than Vanille Ambre. It doesn't matter if you smell AB first or start by reading the list of notes (aldehydes, aluminum, slate, pebble, water, cedar and metallic notes): you are going to think of Comme des Garçons, in particular the second half of Odeur 71 and the Synthetic series, especially Dry Clean, because AB is a more or less exact copy of the idea behind these scents. If you've never smelled these CdG fragrances before and have felt a gap in your life that can be filled only by an overpriced scent that is harsh, unattractive, obsessively clean, viciously synthetic, and metallic the way chewing on tinfoil with a mouthful of fillings is metallic, then BLOOD Concept AB may be just what you've been looking for. First, the name, which is excellent, the sort of thing you can't believe nobody thought of before. 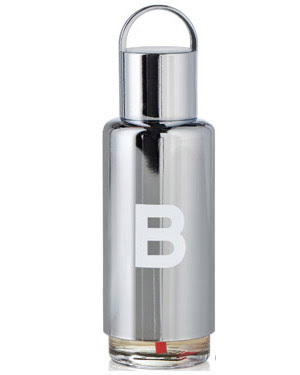 Second, the bottle, which you can't quite figure out. 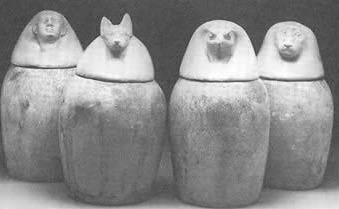 Is it referencing an Egyptian canopic jar? 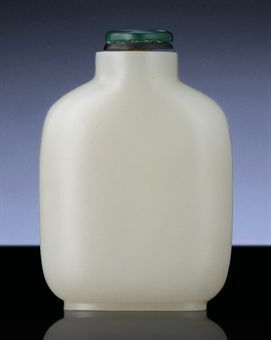 A Chinese white-jade snuff bottle? Ancient? Modern? Functional? Decorative? 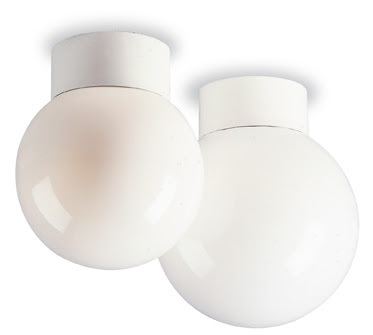 Plastic, glass, porcelain, stone? The Huitième Art house bottle could be almost anything, from almost any time period (well, maybe not the Baroque), and that's intriguing. 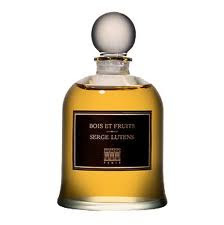 And finally of course the fragrance, which at first sniff seems like a fairly standard-issue variant on an amber scent, all base notes, but gradually unfurls itself to reveal a heart of sugared myrrh, simultaneously sweet and bitter but not too much of either, with a dose of black licorice candy and a comfortingly milky-sweet vanilla base. 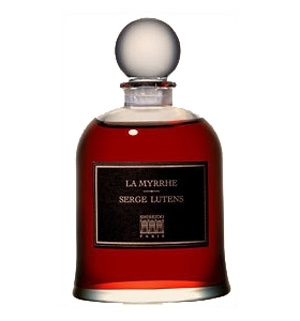 What it calls to mind is a highly simplified version of Serge Lutens' Douce Amere, and if that scent is just too strange, if you like the idea of Lutens but not the execution, Myrrhiad may be just the thing to warm you up on a cold fall day. Be honest, now: if you were presented with a lineup of a dozen fragrances of which you knew nothing, each named after a sign of zodiac, even if you knew that astrology is a load of complete nonsense, wouldn't your first instinct be to reach for the bottle that corresponded to your own sign? Maybe not you. But I would, and I think most other people would, too. 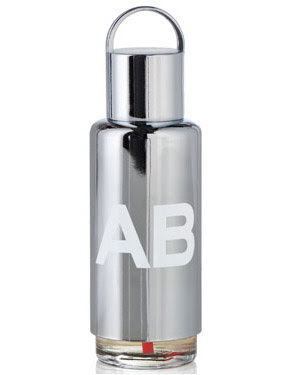 And likewise, if you were confronted with a line of fragrances named after blood types, wouldn't you first want to try the one that matched your own blood type, just to see if it really suited you in some mysterious way? So that's what I did. I have boring old type O-positive blood, the most usual in most parts of the world, at least here in Canada, but type O-positive is the universal donor, so anybody can get a transfusion from me, so there's that. 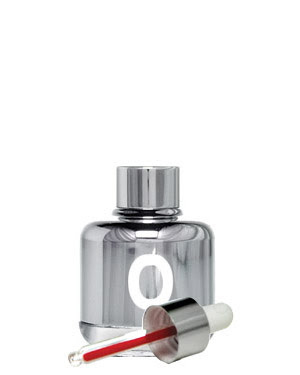 Therefore, out of the four BLOOD Concept fragrances, I naturally chose O to try first. Not two weeks ago I was writing about Bond No. 9's Bryant Park, which is dominated by raspberry, and a few years back I raved about Lacoste Elegance, a men's scent with what I thought was an unusually potent raspberry note. 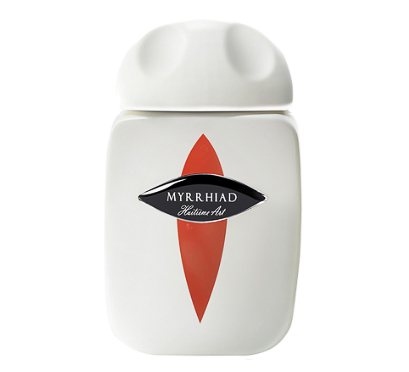 O, too, is dominated by raspberry, and in all three scents that note lasts an uncommonly long time. That is one hell of a synthetic. O doesn't just smell of raspberry — there are other things in there, and if you just want that one thing there's always Demeter's enchanting but very short-lived Raspberry Jam — but raspberry is clearly the entire point of it in the end. Straight out of the bottle it's a mishmash of frankly unconnected things, an odd wild-mushroom-earthiness and a dab of synthetic rose (which allied with the raspberry calls to mind CdG's Rose but is weirder than that) and some cedar, all of which gradually drop away over the course of four hours or so to leave hardly anything but that durable raspberry. There's supposed to be a metallic note, because blood is full of iron and is said to have in quantity a metallic smell often compared to copper, but I don't smell anything particularly metally about it. 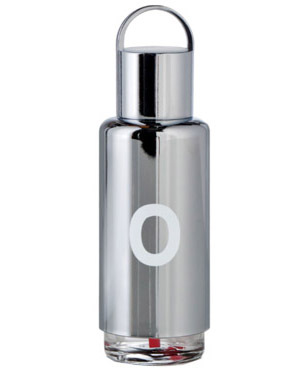 O is very strange, and I can't say it's very good, but it isn't quite like anything I've ever smelled. It certainly isn't me, blood type or not.